New luxury vinyl decking material is now available on all skirted luggage carts! Step up your luggage cart game with six beautiful wood color options that are sure to turn heads and make your equipment stand out from the pack. Now available on all skirted luggage cart models! Birdcage® Luggage Cart in 2" diameter solid Brass tube, 8" black pneumatic wheels in brass plated hubs & caster forks, carpeted deck, solid brass skirt, full wrap-around bumper and two push bars. This model is available through our Quick Ship Program (in most cases, ships in one week). Birdcage® Luggage Cart in 2" diameter solid Brass tube, 8" cushion grey non-marking wheels in brass plated caster forks, carpeted deck, solid Brass skirt, full wrap-around bumper and two push bars. This model is available through our Quick Ship Program (in most cases, ships in one week). Birdcage® Luggage Cart in 2" diameter solid Brass tube (longer and lower design), 8" black pneumatic wheels in brass plated hubs & caster forks, carpeted deck, solid Brass skirt, full wrap-around bumper and two push bars. This model is available through our Quick Ship Program (in most cases, ships in one week). Birdcage® Luggage Cart, 1.5" diameter tubular satin Diamond Textured stainless steel superstructure, carpeted deck, brushed stainless steel skirt, full wrap-around bumper and two 1.5" diameter push bars, 8" cushion grey non-marking wheels in chrome plated caster forks. Polished Stainless Steel version shown. Birdcage® Luggage Cart, 1.5" diameter tubular polished Diamond Textured stainless steel superstructure, carpeted deck, polished stainless steel skirt, full wrap-around bumper and two 1.5" diameter push bars, 8" cushion grey non-marking wheels in chrome plated caster forks. Polished Stainless Steel version shown. Birdcage® Luggage Cart, 1.5" diameter tubular brushed stainless steel superstructure, carpeted deck, brushed stainless steel skirt, full wrap-around bumper and two 1.5" diameter push bars, 8" cushion grey non-marking wheels in chrome plated caster forks. Polished version shown. Birdcage® Luggage Cart in 2" diameter polished stainless steel tube, 8" black pneumatic wheels in chrome plated caster forks, carpeted deck, polished stainless steel skirt, full wrap-around bumper and two push bars. This model is available through our Quick Ship Program (in most cases, ships in one week). Birdcage® Luggage Cart in 2" diameter satin Diamond Textured brushed stainless steel tube, 8" black pneumatic wheels in chrome plated caster forks, carpeted deck, brushed stainless steel skirt, full wrap-around bumper and two push bars. Birdcage® Luggage Cart in 2" diameter polished Diamond Textured brushed stainless steel tube, 8" black pneumatic wheels in chrome plated caster forks, carpeted deck, polished stainless steel skirt, full wrap-around bumper and two push bars. Satin version shown. Birdcage® Luggage Cart in 2" diameter brushed stainless steel tube, 8" black pneumatic wheels in chrome plated caster forks, carpeted deck, brushed stainless steel skirt, full wrap-around bumper and two push bars. Polished version shown. Birdcage® Luggage Cart in 2" diameter polished stainless steel tube, 8" cushion grey non-marking wheels in chrome plated caster forks, carpeted deck, polished stainless steel skirt, full wrap-around bumper and two push bars. This model is available through our Quick Ship Program (in most cases, ships in one week). Birdcage® Luggage Cart in 2" diameter satin Diamond Textured stainless steel tube, 8" cushion grey non-marking wheels in chrome plated caster forks, carpeted deck, brushed stainless steel skirt, full wrap-around bumper and two push bars. Polished Stainless Steel version shown. Birdcage® Luggage Cart in 2" diameter polished Diamond Textured stainless steel tube, 8" cushion grey non-marking wheels in chrome plated caster forks, carpeted deck, polished stainless steel skirt, full wrap-around bumper and two push bars. Polished Stainless Steel version shown. Birdcage® Luggage Cart in 2" diameter brushed stainless steel tube, 8" cushion grey non-marking wheels in chrome plated caster forks, carpeted deck, brushed stainless steel skirt, full wrap-around bumper and two push bars. Birdcage® Luggage Cart in 2" diameter polished stainless steel tube (longer and lower design), 8" black pneumatic wheels in chrome plated caster forks, carpeted deck, polished stainless steel skirt, full wrap-around bumper and two push bars. This model is available through our Quick Ship Program (in most cases, ships in one week). Birdcage® Luggage Cart in 2" diameter satin Diamond Textured stainless steel tube (longer and lower design), 8" black pneumatic wheels in chrome plated caster forks, carpeted deck, brushed stainless steel skirt, full wrap-around bumper and two push bars. Polished version shown. Birdcage® Luggage Cart in 2" diameter polished Diamond Textured stainless steel tube (longer and lower design), 8" black pneumatic wheels in chrome plated caster forks, carpeted deck, polished stainless steel skirt, full wrap-around bumper and two push bars. Birdcage® Luggage Cart in 2" diameter brushed stainless steel tube (longer and lower design), 8" black pneumatic wheels in chrome plated caster forks, carpeted deck, brushed stainless steel skirt, full wrap-around bumper and two push bars. This Deluxe Luggage Cart comes with a 1.5” round tubular superstructure in Polished Brass. It features a unique design that is guaranteed to turn heads. It is equipped with a reinforced solid brass skirt, a full wrap-around bumper, and a carpeted deck. Four 8" Black Pneumatic wheels in Brass plated forks provide for easy maneuverability. Deluxe Luggage Cart, 1.5” square tubular polished Stainless Steel superstructure, T-hanger bar, 6" cushion grey wheels in chrome plated forks, dual wrap-around bumpers, polished Stainless Steel skirt. Deluxe Luggage Cart in 2" diameter polished Stainless Steel tube, 8" black pneumatic wheels in chrome plated hubs & forks, polished stainless steel skirt, full wrap-around bumper, two 2" diameter push bars. Deluxe Luggage Cart in 2" diameter satin Diamond Textured Stainless Steel tube, 8" black pneumatic wheels in chrome plated hubs & forks, brushed stainless steel skirt, full wrap-around bumper, two 2" diameter push bars. Deluxe Luggage Cart in 2" diameter polished Diamond Textured Stainless Steel tube, 8" black pneumatic wheels in chrome plated hubs & forks, polished stainless steel skirt, full wrap-around bumper, two 2" diameter push bars. Satin version shown. This Deluxe Luggage Cart comes with a 1.5” round tubular superstructure in Polished Stainless Steel. It features a unique design that is guaranteed to turn heads. It is equipped with a reinforced stainless steel skirt, full wrap-around bumper, and a carpeted deck. Four 8" Black Pneumatic wheels in chrome plated forks provide for easy maneuverability. 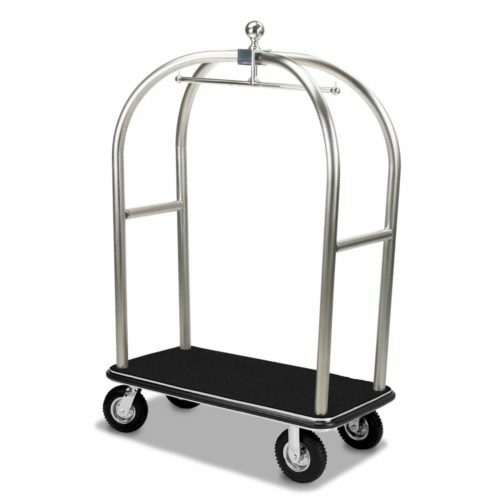 This Deluxe Luggage Cart comes with a 1.5” round tubular superstructure in Brushed Stainless Steel. It features a unique design that is guaranteed to turn heads. It is equipped with a reinforced stainless steel skirt, full wrap-around bumper, and a carpeted deck. Four 8" Black Pneumatic wheels in chrome plated forks provide for easy maneuverability.